North Korea's leader Kim Jong Un makes a statement regarding U.S. President Donald Trump's speech at the U.N. general assembly, in this undated photo released by North Korea's Korean Central News Agency in Pyongyang, Sept. 22, 2017. North Korea indicated it may soon test a hydrogen bomb in the Pacific Ocean after the country’s leader Kim Jong Un warned he would match U.S. President Donald Trump’s threatening words and new sanctions with equally provocative action. “Action is the best option in treating the dotard who, hard of hearing, is uttering only what he wants to say,” said Kim in statement that was released by the North Korean state news agency KCNA. The agency released a photo of the North Korean leader reading the statement. FILE - North Korean Foreign Minister Ri Yong Ho gets into a car at Beijing Capital International Airport in Beijing, China, Sept. 19, 2017. North Korean Foreign Minister Ri Yong-ho, who will address the United Nations Friday, told reporters in New York that Kim likely intends to carry out a hydrogen bomb test in the Pacific Ocean. Attempting to conduct an open air nuclear test in international waters would be a highly risky and aggressive act that could, at the very least, expose islands in the Pacific to dangerous levels of radiation, as well damage electrical systems in the region from the strong electromagnetic pulse (EMP) generated by the blast. 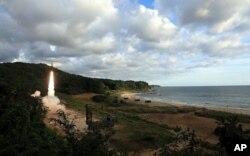 It could also draw the U.S. into taking preventive military action. “That could trigger probably the strongest response, other than an actual military attack I think, that is probably about the limit where North Korea could go,” said Daniel Pinkston, a regional security analyst with Troy University in Seoul. Pyongyang conducted its sixth and largest nuclear test earlier this month, but all its atomic bombs have been detonated in an underground facility. The last reported open-atmosphere nuclear test was conducted by China before 1980, according to the International Atomic Energy Agency (IAEA.) The U.S. and the Soviet Union detonated numerous atomic bombs in the ocean and upper atmosphere before signing the 1963 nuclear test ban treaty that prohibits atmospheric testing of nuclear weapons. North Korea has also conducted numerous ballistic missile tests with the goal of developing a nuclear tipped intercontinental ballistic missile (ICBM) capable of targeting the U.S. mainland. However, both President Trump’s harsh rhetoric and Kim Jong Un’s provocative response may also be diplomatic ploys to gain a future negotiating advantage. “The exchange of blusters may indicate that both sides want to compel the other side to back down with the assumption that the other side prefers a diplomatic solution to the current situation,” said Bong Young-shik, with the Yonsei University Institute for North Korean Studies in Seoul. FILE - Japan's Chief Cabinet Secretary Yoshihide Suga speaks to the media during a press conference at the prime minister's official residence in Tokyo. U.S. allies in Tokyo and Seoul condemned the North Korean leader for threatening another violation of United Nations resolutions prohibiting the testing of nuclear weapons and ballistic missiles. 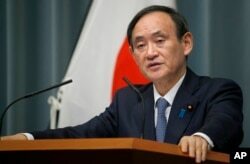 “North Korea’s remarks and behavior are provocative to regional and international security, and they are absolutely unacceptable,” said Japan’s Chief Cabinet Secretary, Yoshihide Suga. The South Korean government, which has tried to balance sanctions pressure by approving $8 million in humanitarian aid to North Korea this week, has again called on Pyongyang to engage in dialogue to reduce tensions. “North Korea must immediately stop reckless provocations that lead to isolation and collapse, and choose to come out to talk for denuclearization to resolve North Korea’s nuclear issue peacefully,” said South Korean Unification Ministry spokesman Baik Tae-hyun. The Trump administration Thursday also announced new unilateral sanctions intended force financial institutions to choose between doing business with the U.S. or North Korea. The executive order authorizes the Treasury Department to freeze assets of people and organizations that conduct “significant trade in goods, services or technology with North Korea,” said U.S. Treasury Secretary Steve Mnuchin. The presidential order specifically targets the construction, energy, financial services, fishing, information technology, manufacturing, medical, mining, textiles, and transportation industries in North Korea. The new U.S. sanctions could complicate relations with China, which accounts for 90 percent of all trade with North Korea. Beijing has supported increasing United Nations sanctions but has objected to unilateral measures.